I haven't participated in the Mac Attack Challenge for a while, but this month's theme was so interesting I wanted to give it a go. 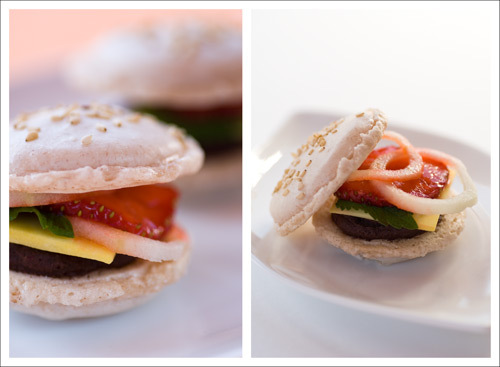 Ballpark-snack macarons are the topic of this month's Mactweets. I have actually never been to a big ballgame in Germany, neither have I been at a hockey game all those years I lived in Canada. I know, shame on me, but in my defense, I have been to several football and baseball games while I was living in San Francisco. The football games always started with a tailgate party, which was totally new to me. I mean who would bring half of his kitchen to a parking lot. But it was always a lot of fun, often more than the actual game. 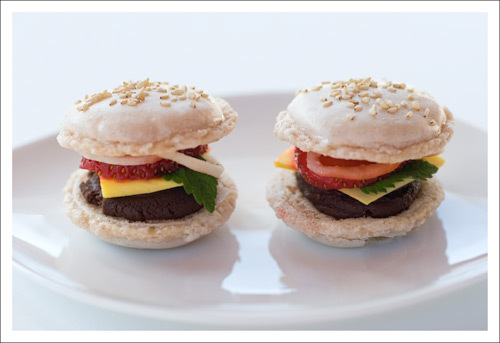 Most people would make burgers, and this is what I wanted to make as my macarons. I have seen similar Macs a while ago and always wanted to try them, since they looked so cute. Ganache filled macarons are always on the sweet side, but with all the fruit toppings it tastes really good. They would make a cute dessert for any BBQ party or picnic. green apple ~ as "onion rings"
mint leaves ~ as "lettuce"
In a stand mixer fitted with the whisk attachment, whip the egg whites to a foam, then gradually add the sugar until you obtain a glossy meringue. Do not overbeat your meringue or it will be too dry. Place the powdered sugar, almonds and cinnamon in a food processor and give them a good pulse until the nuts are finely ground. Add them to the meringue, give it a quick fold to break some of the air and then fold the mass carefully until you obtain a batter that falls back on itself after counting to 10. Give quick strokes at first to break the mass and slow down. The whole process should not take more than 50 strokes. Test a small amount on a plate: if the tops flattens on its own you are good to go. If there is a small beak, give the batter a couple of turns. Fill a pastry bag fitted with a plain tip (Ateco #807 or #809) with the batter and pipe small rounds (1.5 inches in diameter) onto parchment paper or silicone mats lined baking sheets. Sprinkle half of the shells with sesame seeds. Let the macarons sit out for 30 minutes to an hour to harden their shells a bit. In the meantime, preheat the oven to 280 degrees Fahrenheit (140° Celsius). When ready, bake for 15 to 20 minutes, depending on their size. Let cool. If you have trouble removing the shells, pour a couple of drops of water under the parchment paper while the sheet is still a bit warm and the macarons will lift up more easily do to the moisture. Don't let them sit there in it too long or they will become soggy. Once baked and if you are not using them right away, store them in an airtight container out of the fridge for a couple of days or in the freezer. Heat the heavy cream until boiling, then pour over the chocolate. Stir slightly until chocolate has melted completely. Let cool before filling the shells. You can whip the ganache a little before filling the macarons to get a little more volume. Cut the mango in small slices, then cut them in squares. They will be your cheese imitate. Cut the strawberries in small slices, they will serve as your tomatoes. Slice the apple in small slices, then cut out circles. Cut out a smaller circles out of your circles, they will be your onion rings. Cover with some lemon juice until using, so they will not get brown. Get the mint leaves ready as your lettuce. Pipe the ganache filling with help of a pastry bag on the center of one shell to make it look like a hamburger patty. 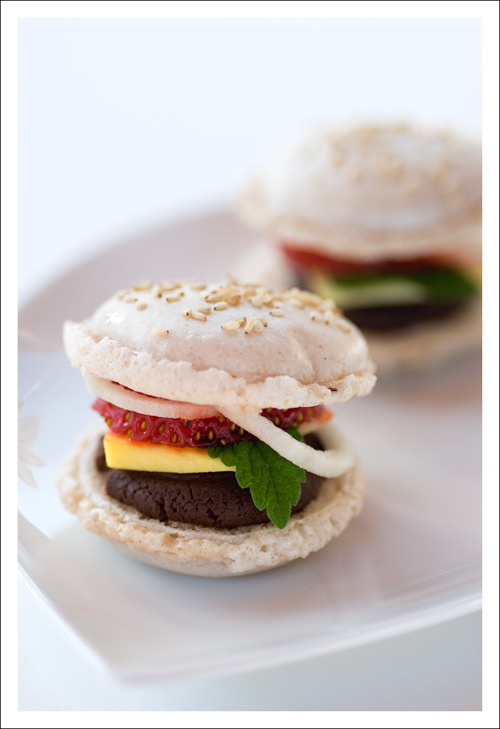 Top with your burger toppings and put a macaron shell with sesame seeds on top.